Banking is now at your fingertips 24/7. On our website and mobile app you can access your accounts, transfer money, pay bills and much more. Looking for an easy way to manage bank accounts? or download the Personal FNB Online and Mobile Banking Guide. FNB Mobile fits your lifestyle. 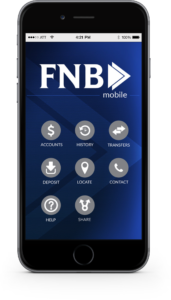 Simply download the FNB Mobile App on your smart phone and have your account information at your fingertips. FNB Mobile provides all the convenient services you have through Online Banking and is available for both Android and iOS.